State-of-the-art technology for testing, calibrating and maintaining virtually any induction loop system. 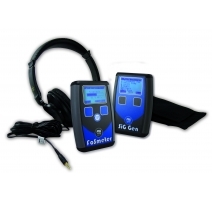 The range features our innovative FPROK1 FosMeter-Pro Test Kit, the FPROSG Calibrated Audio Signal Generator and the RXTI1 Loop Listener. Used together, they represent the most reliable method of ensuring that a system is working correctly. Hearing Loop Test Equipment There is 1 product.